achieve the retirement you want. Americans may have to rely more heavily on personal savings to fund their retirement. Demographic pressures on Social Security and the evaporation of defined-benefit retirement plans like pensions are forcing those nearing retirement to save more or do without. The younger you start saving, the better. Assuming an 8% return, a 25-year-old saving $345 per month for 20 years – but then not another penny – will have $1 million at age 65. By contrast, a 45-year-old would need to save nearly $1,700 per month to reach the same goal. Saving doesn’t have to be a chore, but it does take discipline. Identify the frivolous expenses you can do without, and then invest – and not spend! – the savings. Let compound interest do its job. According to a 2008 study from Hewitt Associates, only a quarter of employees roll over their 401(k) balance to a new plan when leaving a job. Those who don’t are essentially starting over with each career change. Cashing out or withdrawing retirement funds early not only reduces how much interest your investment can accrue, but you’ll likely pay taxes – and, if you’re younger than 59½, a 10% penalty – on the withdrawal. Most 401(k)s allow you to borrow against your balance, but they typically require the loan be repaid within five years. There are no loans against IRA balances, but the IRS does allow a few narrow exceptions to the 10% penalty, such as for a severe disability. A sound retirement plan carefully coordinates timing – how soon to pay off your mortgage, when to file for Social Security benefits, when to begin withdrawing funds. If you’re married, you may want to consider insurance policies and survival benefits as well. Don’t assume you’ll want to work. A “working retirement” may seem like a good idea when you’re young, but many people find their enthusiasm – or physical ability – to work wanes with age. A financial plan for retirement is never “set it and forget it.” Life events such as marriages, births and career changes can quickly make current retirement plans out-of-date. The most important takeaway is the sooner you start saving for retirement, the more likely you’ll achieve the retirement you want. 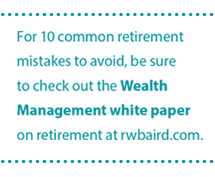 Your Baird Financial Advisor can help you get started or make sure your current retirement plan is working for you.